Four people are said to have died in clashes before the protests, as riot police mobilise to guard demonstrators. National Assembly president Juan Guaidó, who organised the opposition march, is urging the army to disobey the government. On Wednesday he took an oath where he declared himself as “acting president” of the country. Before the protests, the US government signalled its support for Mr Guaidó and called for President Maduro to go. Early images from Wednesday’s protests show some demonstrators facing off against National Guard security forces in the capital Caracas, and tear gas being fired. Anti-government protestors have turned up in “many cities” across the country, newspaper Tal Cual reported Wednesday. 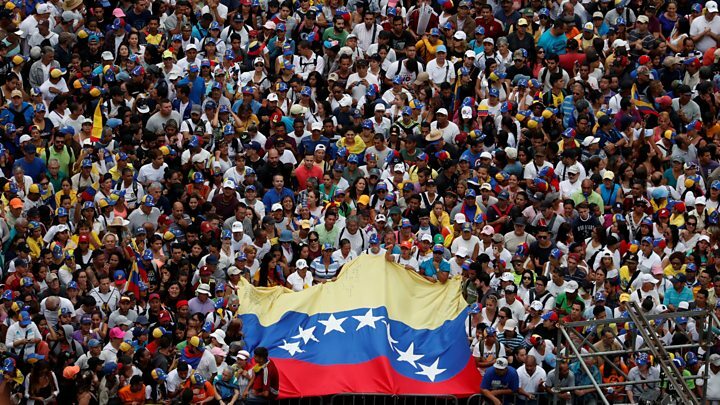 Other demonstrations are being held in support of Mr Maduro. Venezuela has been in economic freefall for a number of years under the president’s leadership. President Maduro’s re-election in May 2018 was labelled a sham by much of the international community. The main opposition boycotted the poll and there was reports of vote-rigging in Mr Maduro’s favour. The US has signalled their strong backing for the opposition. Ahead of Wednesday’s protests, US Vice-President Mike Pence wrote an opinion piece in the Wall Street Journal in support of “the National Assembly and Mr Guaidó”. Venezuelan Vice-President Delcy Rodriguez dismissed Mr Pence’s intervention, reportedly telling a news conference “Yankee go home”. Opposition protestors are backing an attempt by Mr Guaidó to replace Mr Maduro and serve as an interim president ahead of new elections. The governing Socialist Party announced a rival protest to counter the opposition march – and supporters on Wednesday have gathered for both sides. On Tuesday, Venezuela’s Supreme Court on Tuesday asked the state prosecutor to investigate whether Mr Guaidó had committed a crime. Wednesday’s demonstrations come just two days after 27 National Guard soldiers allegedly revolted against the government at a guard post in the capital, Caracas. Government officials dismissed it as a cover to steal weapons, but Mr Guaidó has urged others to follow in revolt. Addressing soldiers on Monday, Mr Guaidó promised amnesty for those who refused to serve the government. Overnight protestors in the southern city of Puerto Ordaz reportedly toppled a statue of late socialist leader Hugo Chavez – a symbolic gesture against Mr Maduro’s government. A 16-year-old with gunshot injuries was reportedly among those killed overnight on Tuesday, rights group the Venezuelan Observatory of Social Conflict says.